We do not get a lot of Mother’s Day libation submissions… none actually. Most people stick to the usual suspects e.g. Mimosas, Wine Spritzers, Bloody Marys … the stuff you would see served at brunch funny how we only brunch during special occasions. Our friends at Premier Innovations Group, the masterminds behinds Clique Vodka (it’s more of a lifestyle movement than a beverage but that’s for another time) sent us several Mothers Day cocktail recipes, created by their Director of Mixology, Tara Shinn. 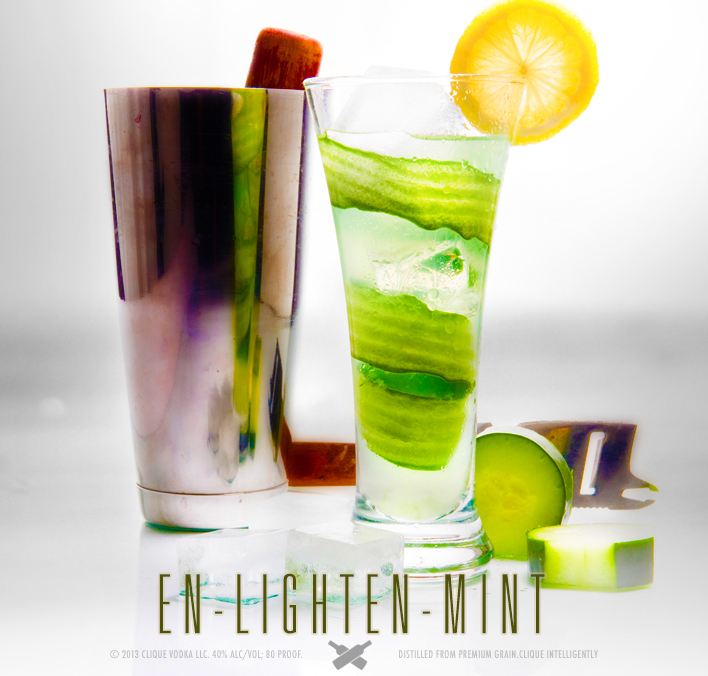 (Tara is one of the top mixologists in Pittsburgh) One of our favs is the En-lighten-Mint. Muddle infused Clique Vodka, 2 lemon wheels, and mint sprig. Strain in a tall glass with ice and top with soda water. Our notes: It’s as refreshing as it looks. We didn’t have time to steppe cucumbers in vodka so we opted to muddle a couple slices of cucumber with the lemon and mint. The outcome should be close. Looking forward to making more of these on hot summer days.